_ When your family, your home, and the very land you stand on are destroyed, what do you do? If you are a shifter of Massa, you turn around and fight. You fight, because the blood oath will have it no other way. 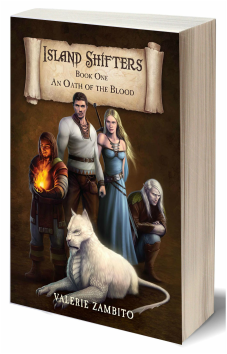 The idyllic lives of four elemental shifters living in the exiled land of Pyraan are shattered when a tour of legion duty gives witness to a brutal enemy invasion. Despite the heroic efforts of the shifters, the land falls to the invaders. As the only survivors, the four friends are forced to flee south into the lands from which they were banished to warn of the invasion. Heartbroken and weary, the shifters soon learn that the safe haven they hoped to find is cloaked in danger. Throughout a journey fraught with prophesy, betrayal and peril, an enduring friendship prevails, love blossoms, and a riveting saga unravels.